This is round two of the All In Vinyl subscription series. This particular split pairs two bands that I see the names of quite often, but I've never really spent that much time with. As a result I have to plead guilty to not really knowing very much about either, despite owning records by at least one of them. I know that sounds kind of weird, but let's be honest. With the amount of records I buy, there's going to be some 7"s that might not get played as often as I'd like. 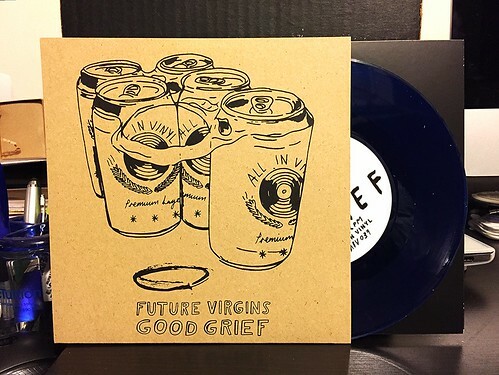 I had a Future Virgins split 7" with Toys That Kill. Toys That Kill were the band that drove that purchase, but I do remember thinking that Future Virgins were pretty good and worth diving further into their catalog. I never really got around to that, so they are still pretty much a new band to me. The two songs on this split are pretty good. I enjoy the music side of their equation quite a bit. It's straightforward and catchy with hooks in the right places. I'm not digging the vocals as much. We all know I like some raspy/gruff vocals, but it's taken a bit to far here. The vocals sound strained and I kind of want to check to see if the singer needs a cough drop. These songs are pretty good, but I'm not liking it as much as I would if the vocals were slightly more melodic. Good Grief is another band that I've seen around when buying records. I actually thought I had something else by them already, but I guess I never bought that split of theirs with BUZZorHOWL (or at least I can't find it right now). Good Grief lean more towards the indie rock side of the punk rock spectrum. The vocals are clean and there are some pretty stellar backing harmonies thrown in for good measure. The vocals remind me of The Vacant Lot and that's never a bad thing. There's a nice amount of fuzzy guitar and catchy riffs. Honestly these two songs are great, I really should try to find more by these guys, but there seems to be another band called Good Grief that advertises themselves as classic rock...with an edge! I'll figure it out eventually.